Because you – I – call myself ‘a writer’ (because it sounds better, when I’m asked what I do, than saying ‘erm … ahhhhm … err … Well I’m sort of a stay at home mum (whose part time mothering habit leaves her in an empty nest for most of the year)… and wife … and I write a bit’.) I keep writing despite the rejections. But, even in age and after a huge, huge amount of practice (at receiving rejections and trying not to weep for the futility of it all) dismissals of pitches/submissions/essays still sting. The email comes in, you note the sender, register the subject, allow your heart to soar by the teeniest degree, and then you read the message and the bottom falls out of your world. For a bit. Just a bit. An hour. An afternoon. A day. Depending on the effort involved, the enthusiasm, the hope. Yesterday a computer generated rejection to inform me that my submission had not made the longlist – and no, the fact there were hundreds of entries, all of sterling standard did not help; the attached tips on How to Write Better only made it worse. The day before an emphatic No from an editor based on sample pieces he’d requested and I’d carefully, carefully honed and sent. I often question the hours spent crafting words, conjuring up ideas to send to editors. I’ve sent thousands over the years. Most have been ignored. Or turned down. A few have led to stories that never ran. The occasional one morphed as ecstatic bylined publication. But it is, on balance, in the cold light of day, when one calculates effort in/profit out, mostly a waste of time. (But Time is something I can afford to fritter a little). And I love language. I read a cleverly fashioned phrase on a page and I savour it as you would an exquisite taste on your tongue. I roll it around and dissect it and notice that each word has been carefully chosen to colour the expression more vividly so that it sits perfectly: a line of art that delivers much more than just neatly arranged, properly punctuated, letters. Finding precisely the right word for a given slot is a joy. (I can spend an inordinate amount of my TooMuchTime on 500 words). Like finding the piece you’ve been looking for to fill a gap in a jigsaw. And so I suppose that’s why I keep doing it? Writing. Calling myself A Writer? 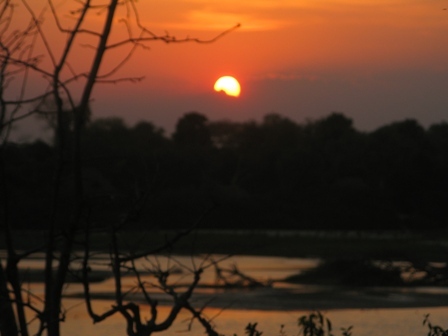 The Selous Game Reserve is huge. 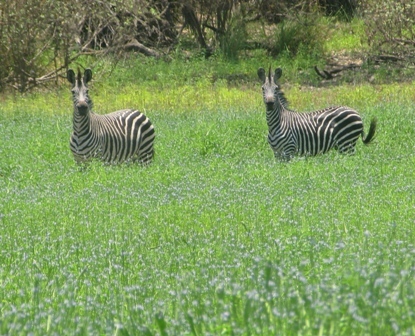 It hunkers low in Tanzania’s belly, its southern boundaries almost touching Mozambique. It’s big and hot and sprawls so that its spread is greater than whole countries; it’s bigger than Switzerland. 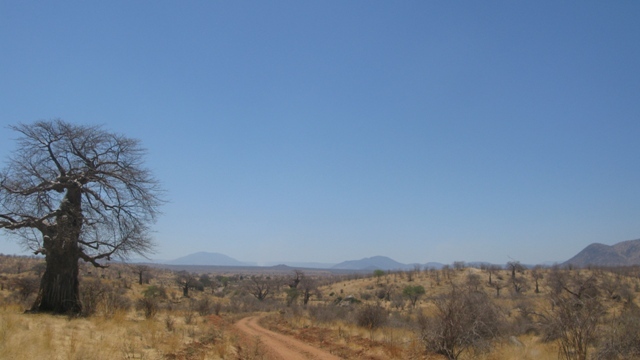 It’s Africa unwieldy, a vast space of sky and scrub and water and wildlife – at 50,000 square kilometers, it is amongst the last and largest protected areas in Africa. Named after Englishman Sir Frederick Selous, a big game hunter and early conservationist who died here in 1917 during World War I, the Selous, the oldest conservation area in Africa, was first designated a protected area in 1896 by the German Governor Hermann von Wissmann, became a hunting reserve in 1905, and was nominated a UNESCO World Heritage Site in 1982. Today the northern corner is preserved as a photographic destination; the rest remains a hunting concession. How, given 25 years in Tanzania, this huge place had evaded our safaris, I can’t tell you. Perhaps because it offers the best component of a real road trip adventure: inaccessibility. It took us fourteen hours to drive there and we sank from high cool hills whose shoulders are draped in green tea and mist to low miombo woodland where mid afternoon temperatures tip 40 degrees when the only sound is the faintest whisper of borassus palms when their papery fronds are nudged by a kilnhot puff of enervated air because even the cicadas, which normally hiss all day long from unseen positions in the bush, are heatexhausted to silencing inertia. The 600 klm Rufiji River slips through a slice of the park before hurrying on toward the sea and even now, even in high hot October as we near the end of kindlingdry summer when the savannah is nicotine yellow and the brush desiccated and brittle, as we anticipate the Rains with panting excitement, even now the Rufiji is huge and wide and running fast. So fast that when we’re on it I can hear the rush of water in the upended vegetation, against the bank which is striped with the telltale rise and fall of past rains and scrambling with creepers that bear confetti white blossom, like jasmine and arterial green tosses two fingers to sapping heat for here the trees are rooted deep and damp. Everywhere’s waiting for rain. The flowers have been forced into evidence so that by the lakes that have morphed with the endless shifting shape of the river the flats are carpeted with blue. 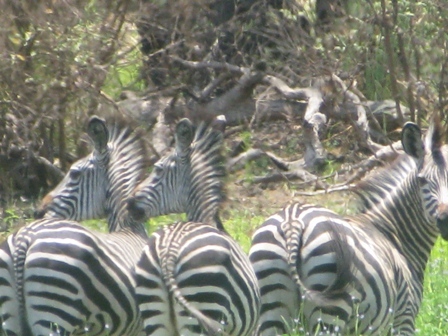 The impala and zebra and warthog all nurse young who will grow fast and fat on soon new grazing. I can see the promise of rain in gathering clouds which dissolve by sunset so that my lens captures the undiluted tangerine light of dusk. We’re here to fish. Or the boys are. I’ve come along in capacity of scribe. Photographer. Groupie. Oh well done Darling! 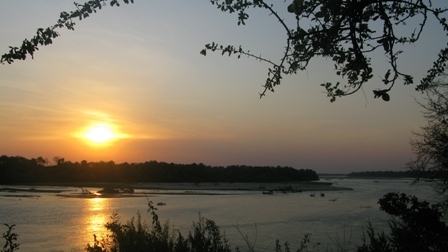 The Rufiji swims with myriad species but it’s Tiger we’re after: big sharp teethed tiger that fight with strength and heart so that you can hear the zip and whine of the line as it rips from the reel when the tiger bites. Pale catfish lurk in the depths too and a few of those are plucked; one almost five feet long, pale scaled, like a finger nail, and long whiskered. Some of the catch is tossed back into the café au lait waters; some go to the boatboy who won’t mind the bones and the muddiness of the flesh. The air squats hot and the riverside sand is baking, it’d scorch your soles if you inadvisably went barefoot. A lot of water is drunk from cool boxes. Sunblock is slathered but the rays still nip below the shade of the meager awning and pinch our skin pink. You can hear the haunting cry of fish eagles; one glides low to swipe the bait. Hippo snort water and rise and sink as we pass, sometimes you can see their wake as they move beneath the surface, with surprising agility given their cumbersome size. 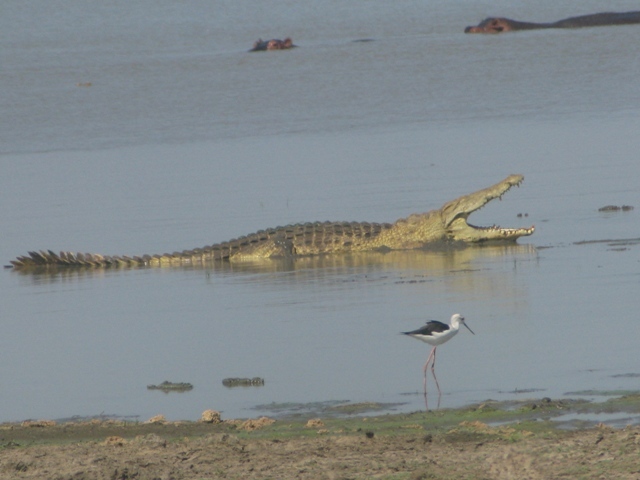 Crocodiles lie jaws agape, as logs or glide in and out of our vision as stealthily as submarines. You couldn’t swim the width of this river if you tried, not without ending up as somebody’s supper. As we head back to camp the breeze rises and is deliciously, vigorously chilled as it collects the cool from the river’s now choppier surface. And when we’re not fishing we’re lost in the vast wilderness that forms this place, seeking midday shade to drink a flask of tea as we watch skittish zebra at the lake’s edge, skittish for the dangers that lurk beneath its soupiness. 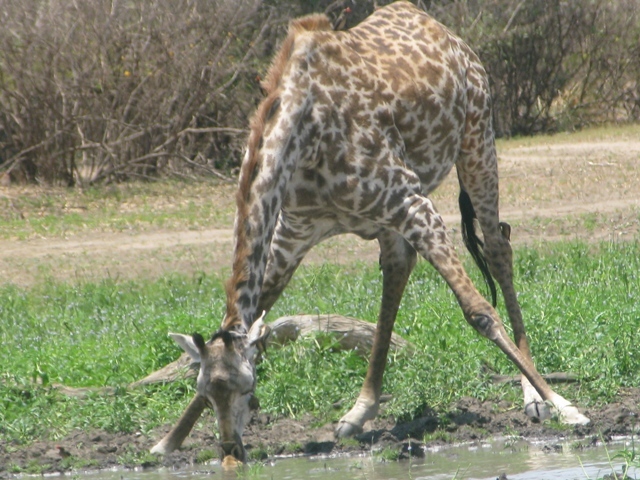 A giraffe arranges it’s long limbs and longer neck into a graceful triangle to drink. 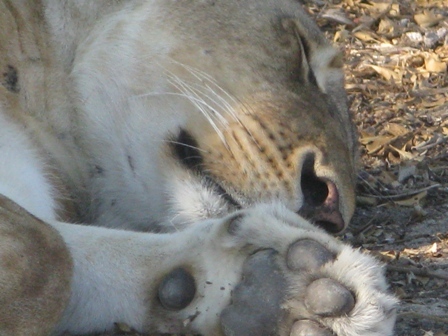 A pair of lions lies in the shade, the only movement the odd flinch against the irritation of a fly and the million butterflies that seem to flutter at their throats; even breathing is heavy work in this heat. Pink tongues loll. Could they, would they, I wonder aloud to Ant, get up the speed to pounce if I stepped out of the car. Don’t doubt it, he says. But for all the game we see – the big somnolent cats, the buffalo, the elephant, the kudu, the gnu – I know that numbers here have collapsed: the Selous, which once hosted the largest elephant population on the planet, has lost 80% of these intelligent, magnificent creatures to poaching – its why they stumble from sight in a state of distressed agitation at the sound of our vehicle – and there are no rhino left. Mankind exhibits such gluttonous arrogance with his assumption that he can annihilate a species for the sake of trinkets and superstition. I think hard about how to pin my few days in this extraordinary wilderness to the page on our long drive home when we eat heavily salted crisps and drink tea. It is always difficult to articulate the affinity one bears to the place you call home. To unpick it and try to explain precisely why a given place fits you. But when Africa swims in your blood and is the dusty grit that stings your eyes to tears, the things that make it my place are its light, the searching, searing, unforgiving light at midday that yields to the long fingered, leanly tapered shadowed and lingering glow at sunset, and the scent of the bush and the heat and the nearness of rain and the absence of it all at the same time, it’s the quick sound of a lizard startled as you step towards the shade with your mug in hand, the ripple of movement, the rustle of parchment dry leaves, it’s the chirps and coughs and sounds of the wildlife on hoof and wing. The sparseness of this place juxtaposed with a contradictory richness. It all conspires to create something that is so achingly familiar, fits so easily, so comfortably that it can be hard to describe it with the majesty that it deserves. The worst thing about loving a person with Depression is that you lose them when they’re ill.
Depression steals their voice, their vigour, their very essence. I have two mums. My well mum. My sick mum. That’s how much her illness changes her; she morphs from brave to timid, chatty to silent, upbeat to downhearted, energetic to enervated. I have spent 35 years in the presence of Depression – sometimes at closer proximity, sometimes at greater distance. I feel its chill no matter how near or far. It’s like a damp sponge; the coldness permeates, soaks through every single conversation, whether across a table or the ether. Depression has a long reach. For a time I felt sure that if I willed it away hard enough, educated myself long enough so that I could outwit it, bullied it, it’d go, Depression, it’d feel unwelcome vibes and shuffle off, embarrassed, afraid to return. But it’s not like that. It’s a cumbersome, thick-skinned illness that, once in residence, sits firmly. It doesn’t matter how much you love a person, or how desperately you want them to get well, if Depression has made itself at home, it’s difficult to evict. Drugs. Talk Therapy. ECT. Vitamins. Mum’s tried them all. It’s hung around for nearly a year this time. It strikes me as I write as peculiar that so intangible an illness bears such a dead weight? And there is another curiosity: that negative thinking can be so profound, so powerful as to obliterate even the tiniest positive? I am not sure Mum is sad when she is ill. But she is not happy? Her thought processes are so tangled and clouded that she can no longer pick a single bright strand and follow it through and know that if she keeps following it she’ll find the beginning and the end and be able to unknot the whole unwieldy mess. It looks so simple to do from the outside. But I know that it’s not. I know that because Depression is like a cancer – Malignant Sadness Lewis Wolpert called it – that eats away so that a person’s sense of self and direction and drive and motivation begin to crumble for the structures built of confidence and belief, and cemented with vigour and smiles, have been consumed by the Beast within, dissolved by the seeping apathy. Having a mum that suffers with Depression is not the worst thing in the world. But I know that being a mum with Depression is. That I – we, my siblings, my children – endorse her illness as real, does that help? This is the first October that I have not had any of my children home. Ever. Through school they always enjoyed a fortnight’s mid term break. Which I enjoyed more. For a long time we used to go to the beach then; October being the best time of year on the East African coast. Not too hot. But hot enough. I didn’t imagine that last October would be the last halfterm that Hat would be home; she came for just 12 days to the little house we’d been lent on a mango farm. I was fragile. She was brave. Life was fraught. We walked a lot. 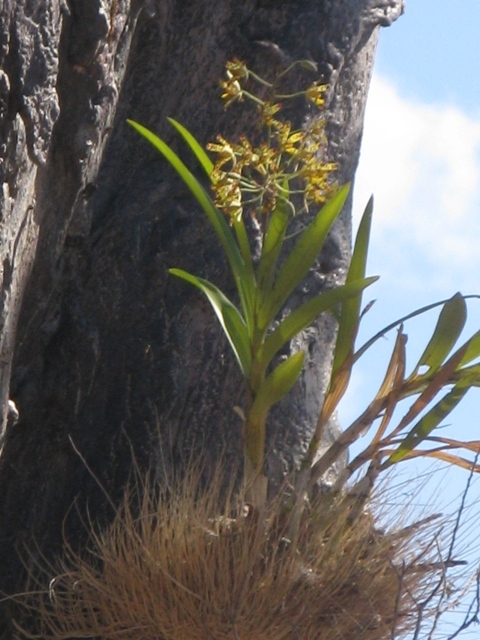 We visited the Sokoke forest together and giggled naughtily behind our guide’s back, she wrote a story about it afterwards. We swam. We watched telly too late curled together on a sofa, the cat stretched out beside us. We saw a huge cobra work its way beneath fallen leaves and called the dogs off for fear somebody would get nipped. A palm frond fell on my head and Hattie worried fretfully all night. I told her it might just knock some sense into me. It was a brittle, betweentimes two weeks. I don’t miss that period in my life. But I do miss her. This October Hat is going to France, to improve her speaking in preparation of final school exams next summer. She will be with another mother. Annette. We have corresponded often, Annette and I, with the help of Babelfish and Google translate, and she has told me that she will take Hat to shop in markets, visit castles, she will make pastry with her. She sounds warm. And I can hear ready laughter in her words. She signs off bisoux Annette. And that, I tell myself sternly, is all that counts; that Hat feel at home even when she isn’t. Today I feel angry. I stomp around on my walk and kick things and shout and scream at the dogs to keep up and stop racing off until I am nearly hoarse. I feel angry because I feel trapped. Because Ant is unhappy. Because I am so far away. Because none of this was our bloody choice. When we left the Outpost, a move that was considered with care and deliberated over for months and months, it was to assume management of the Family Business. We had, from our dusty Outpost dislocation, dreamed and planned and plotted as to how we’d turn the whole thing around, pick it up, dust it off, knock it into profitable shape. We dreamed of creating a home in a place that had been familiar to our children since they were born. We imagined all kinds of enterprises we could introduce: like jam. But the cynics were right: never do Business with Family. And therein lies the catalyst that prompted a chapter of unspeakable unhappiness for my little team. The medium that precipitated an avalanche of chaos. Five homes, four jobs, three countries, two years. We’re not there yet: this isn’t ideal; I’m still turning the pages of an unfinished chapter, hoping for a happy ending. See when we made our choice, we took all the information and we carefully laid it out and dissected it. We drew up spreadsheets to make sure we could pay bills, we talked to our children. We imagined a future. But choices are just the decisions we make as individuals. They’re flakey and insubstantial. Unless we have firm control over extrinstic influences. And we, it turned out, had no control. So it went horribly, unhappily, irreparably wrong. Most of the time I can control the anger, swallow the ugly taste of bile-bitterness. Most of the time. But this week I cannot. This week my husband is sadder than usual; his natural joie de vivre, his self esteem, his positivity have taken a brutal hammering because of all of this. He is no longer whole. He would be if we’d stayed put. And if we’d stayed put, in the secure oblivion of the Outpost, my little business would not have been railroaded and I would be busily preparing for Christmas markets. My children would have had rooms of their own in a stable home for more than a single holiday at a time. And instead of spending the last year flailing and grappling to settle, again, I’d have had the time and the wherewithal and the emotional capacity to support my mum better – she has been in the clutches of another horrible Depression that is almost a year old. Let It Go people say. Move ON. And that is absolutely the right thing to do. But how can I when the fallout of that single bad decision continues to manifest toxically in our lives? Until we have found our place again, until we are truly settled, until my husband has recovered some semblance of the person he was, until I am energetically engaged in my own enterprises again, until I feel able to support those I love with the commitment they deserve, I can’t move on. And perhaps in the meantime the anger sustains me. Mum always advocated a little energetic red-hot anger was a million times better than a lot of enervated Blue. I shall continue to kick and scream and spit vitriol from time to time . Perhaps it will prompt me to make better choices . ‘Will I be eaten by a lion?’ I ask the ranger on the gate. He stops writing in his register, a big book daubed with dirty fingerprints, biro poised. ‘Will I?’ I persist, ‘I’ve heard that three people have been eaten here recently’. After a pause, he snorts, ‘that’s not true’. Rumour has it … I persist … ‘no’, he asserts emphatically, ‘nobody has been eaten in this park’. I grew up in man-eating country. Big maned, big teethed, long clawed man-eaters. Of the carnivorously feline kind as opposed to the sort that prey on other people’s husbands. I was raised on thrilling bedtime tales of the demise of Captain Charles Ryall who, during the building of the East African Railway, was plucked from his bed one night when one of the lions who’d been busily picking off the Indian coolies working on the line which ran through what became our farm, managed to slide Ryall’s carriage door open and, standing on the stomach of the terrified Italian in the bottom bunk, dragged him from the top. His scant remains were found the next morning. I demanded my mother repeat that story night after night, partly for the electric thrill which it sent down my spine so that the hairs on the back of my neck prickled, but mostly for the delicious expression on my little brother’s face: blanched with fear. As cattle ranchers, lions were a perpetual occupational menace: my father was frequently obliged to spend the night curled uncomfortably into the cab of his pickup, rifle across his knee, coffee at his side, cigarette lit, waiting to see if he could put an end to the herd-executing-exercise that a pride had embarked upon. Dad didn’t enjoy lion hunts: he didn’t like killing anything. But he didn’t like not being able to pay his bills either. I listened to him grumble as he pulled a rare sweater on, gather up his cartridge belt and collect his thermos of coffee and the bar of chocolate Mum would have set aside and I didn’t understand what all the fuss was about: to stay up all night and eat Dairy Milk would have been infinitely more exciting than cocoa and a bedtime story at home with your little brother. Even when that story did conjure up big cats with big teeth that made your younger siblings eyes grow wide with fear. But age has delivered that inevitable sense of one’s own mortality, and tempered my juvenile frisson at stories about the fate of the likes of Ryall; the proximity of man-eaters is less thrilling now. 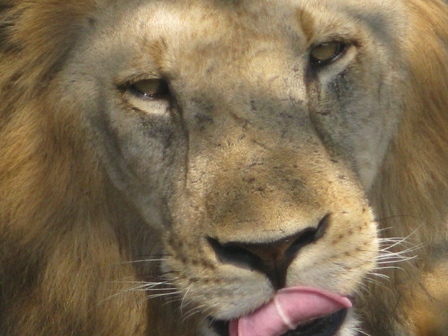 I’m relieved to hear that the lions in the Ruaha have not developed a penchant for human flesh. 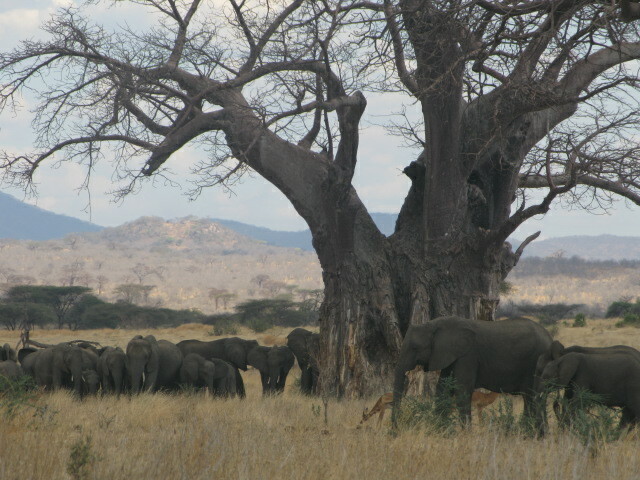 The Ruaha is Tanzania’s biggest national park. 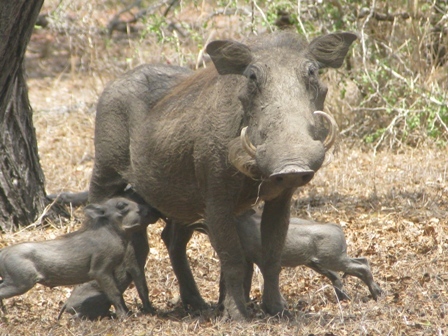 Gazetted in 1910 by the Germans as Saba Game Reserve, it became the Rungwa in 1946 when the Brits were in charge and thirty years later was renamed the Ruaha, after the Great Ruaha River which forms an eastern boundary; Ruvaha in the local Hehe dialect means ‘river’. The park is over 20 000 square kilometers and it feels it. 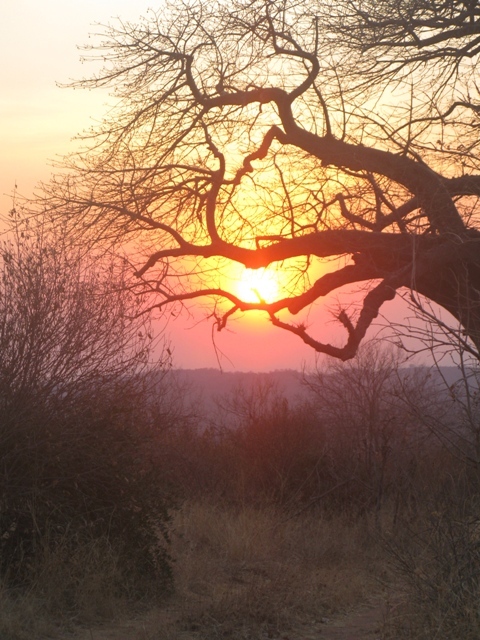 It’s a vast sprawling space where views are long and lean and spare, unfettered by much except distant hills which carve soft curves into the horizon and baobabs which punctuate sharp profiles against evening light. It’s October and the park is toastdry. The air is veiled with dust so that those far away hills look even further, ethereal, as ghosts, their outlines smudged. When the rain comes, in December, it will rinse the atmosphere clear and the hills will draw closer overnight, their shapes suddenly more sharply drawn. 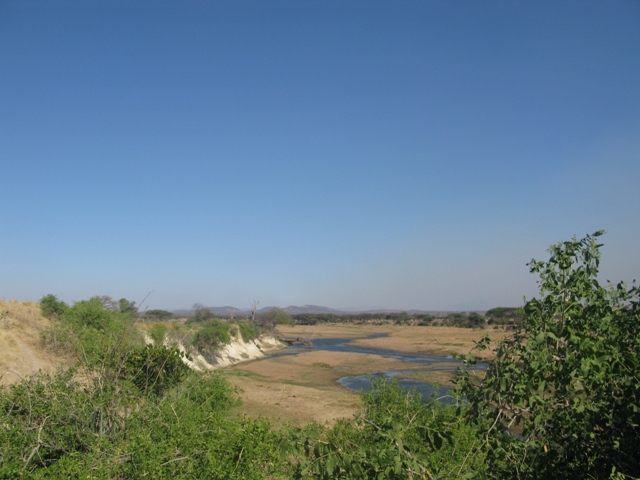 And when the rain falls, the Great Ruaha will become Great again, will fill to the brim its banks, which seem implausibly wide now, a quarter of a kilometer sporting just a trickle. The other arteries that sustain the park – the Jongomero, the Mdonya, the Mwagusi – will all rise and swell and the game will fatten and the savannah will green. But such fecundity is two months away still. Now the grass is baked to the colour of shortbread, the heat feels as if somebody left an oven door open, the shade is thin and animals hunker low and still. The combretum seeds are as aged, faded confetti caught in desiccated boughs, the pepper seed pods are as hollow and as brittle and as light as pingpong balls and leaves silvered with thirst skitter from treetops with the faintest breeze, fragile and winged as butterflies. We set up camp on the Mdonya Sand River, last vestiges of water are long gone, the pits that mark where animals have dug to drink are old and caving in; the riverbed pockmarked with the tread of game. By evening the sand is cool enough to walk across. Come noon it will scald my soles. We light a fire and watch the dark settle like a blanket which stars puncture with bright holes of light. 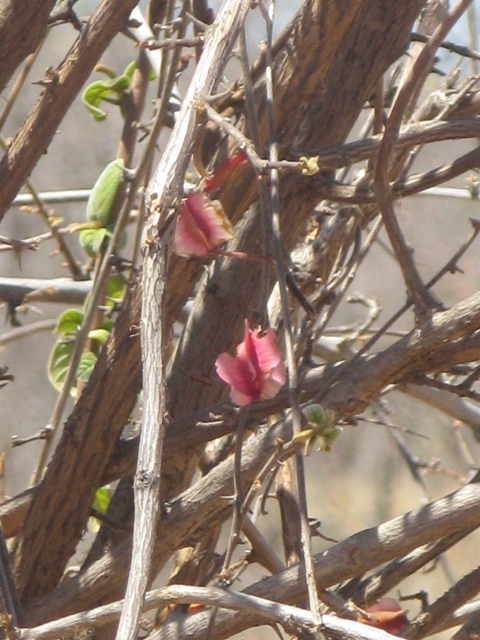 The hiss of daytime cicadas gives way to the soft call of a Scops Owl and the mournful cry of a Thick-knee. And then I hear a lion. Did you hear that? Asks Ant. As if he needs to. I am sitting bolt upright, wielding my small supermarket bought torch in an arc all around me. How far away do you think that is, I whisper. Ooooh. I don’t know? 500 meters. I don’t know much about lion. But I do know that their voices carry. Quite how far they carry I’m not sure. I drag my camp chair closer to the fire. We hear the lion intermittently until just before dawn. From different directions, but never closer. Ant complains the next morning that I behave like a meercat all night, popping up and down to peer into the gloom, amply lit now with a huge Terry’sChocolateOrange moon which hangs syrupy and melts with daybreak. Our pre breakfast game drive takes us south of camp on cinnamonpowder tracks, beyond the kopjes which we can see from our tent, atop which we see mongoose and rock hyrax warming themselves in early sunshine, and onto the shrinking river where hippo populations look larger for the diminishing size of their watery homes. 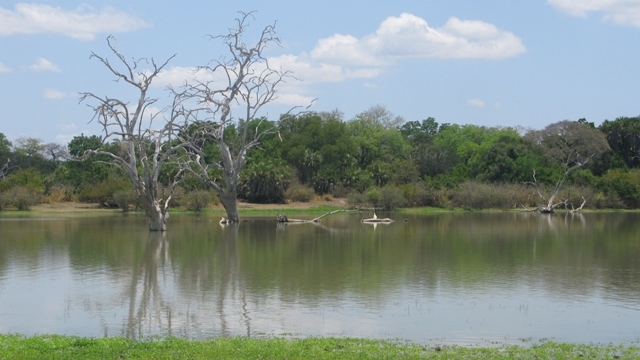 When the water gets very low they will lie in pools so thick you can see the rising give-away bubbles of fish beneath the soupy surface which are plucked neatly out by storks using the hippo’s backs as rafts. 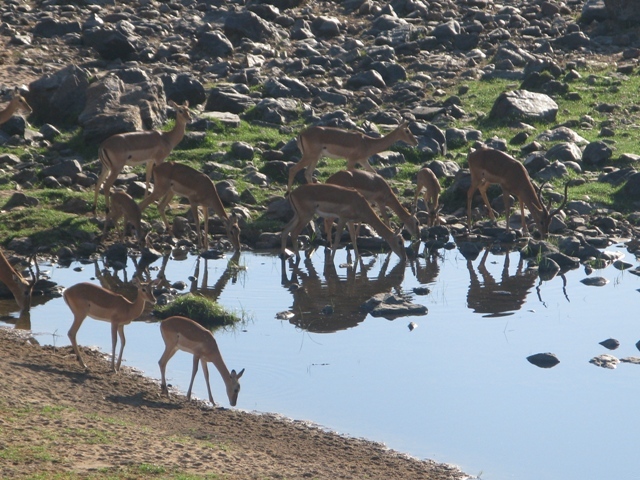 Crocodiles lie sunning themselves on sandspits or slide beneath the river’s shallow surface to stalk unsuspecting game that comes to slake its thirst; impala are jumpy and watchful, their shivering reflections amplify their drinking shapes. 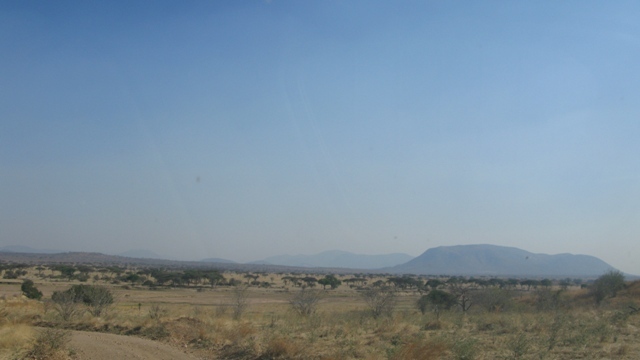 From the river we head west and into the heart of the miombo. 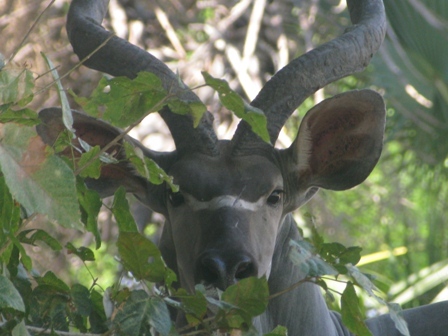 This is Kudu country; Ruaha is famous for its large numbers of these graceful antelope with their enormous ears – their hearing must be incredible’, observes Ant quietly as we watch a herd dissolve as apparitions into the grey scrub, their backs chalkstriped. When I was a child my father always exhibited excitement at a kudu sighting; there were rarer where we lived and their uncommonness elevated spotting one to cause for celebration: ‘how much will you give me if a see a leopard dad’, we’d ask. A shilling he’d say. 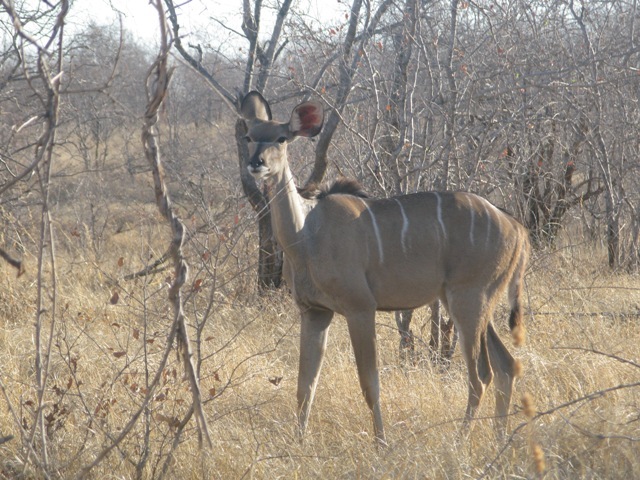 And a kudu; if I see a Greater Kudu? Ooooh, at least another shilling Dad would laugh. 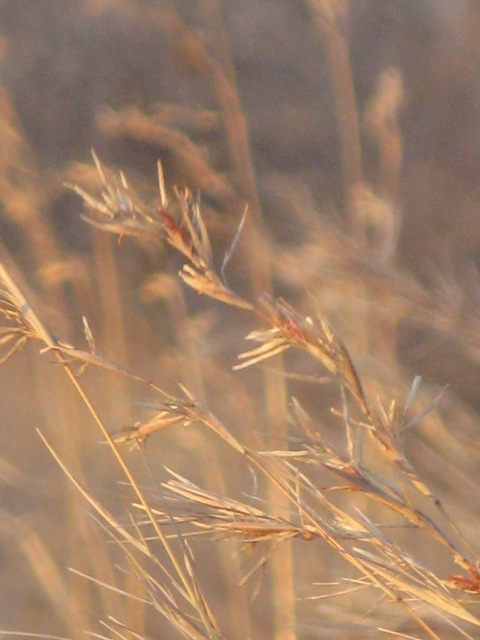 We only ever spied them singly and they slipped shyly and swiftly from sight. Here they live in much bigger numbers so if you miss the first in the herd, you’ll catch the tail ender in your lens as she momentarily stops to gaze at you before vanishing into the bush. We are plagued by tsetse fly in the miombo, they dart through open windows, attracted to our dark car and its motion. I swat futilely with my map and my hat but tsetse are armour plated, even a firm slap does little more than daze them briefly, they shake their heads and recover their composure and are soon buzzing madly and nipping viciously again; they’ll bite through clothes and leave you with huge itchy welts. ‘You have to roll them under your fingers’, says Ant, that’s the only way to kill them. Roll them? I have to catch the buggers first. My dad said if there were tsetse about there were sure to be lion close by. 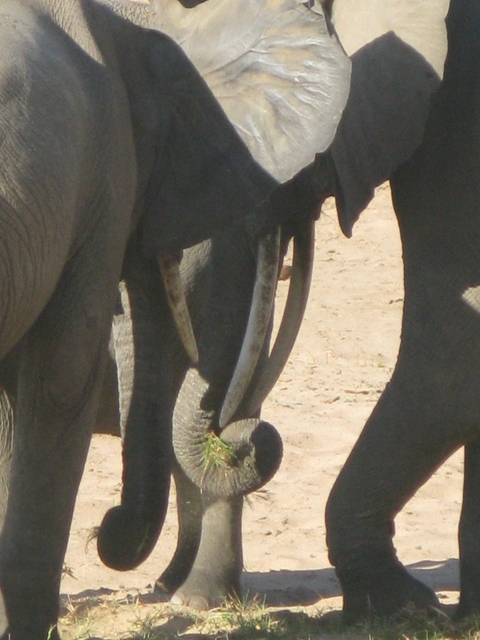 I remember the tsetse in camp. Which we return to when the heat is too punishing to do anything other than follow the game’s example and lie inert in the shadows cast by the acacia behind our tent. Even reading a book is too arduous a task. I doze and listen to the hum of the bush and every now again, I sit myself in the washing up basin and pour mugs full of tepid water over my head and then I stand, arms out, like a cormorant spreadwinged, to dry in the breeze which feels briefly cooler than it really is against damp skin. By 2 in the afternoon it is 40 degrees in the scant shade. By five though, energized and rehydrated with a mug of smoky tea, it is cool enough (cool being relative; the mercury has dropped from 40 to 33) for an evening drive up the Ruaha to where it meets the Mwagusi in a confluence that in the wet will surge and in the dry is a giant sandpit where I watch elephants carefully kicking up small clods of green grass where water once rushed, and coiling it in their trunks to eat. It must be as the most delicate appetizer: a plateful of tender young asparagus spears, sweet with butter. Like the baobab bark which they strip for the pithy moisture beneath. Baobab all over the park at this time year wear elephant wrought wounds, but they will heal and their trunks, polished over centuries as if the gods had wielded a giant can of Mr Sheen, will take on a slightly different more sinewy shape. On account of that same captured moisture, these giant Tolkeinesque upsidedown trees host, I am astonished to note, thousands of citrine-spotted leopard orchids. We drive through woodland of thron trees which stand as a forest of parasols, shielding dozens of species collectively from the sun: impala and fatbottomed zebra, giraffe and buffalo, baboons and elephants all hunker lethargically and in proximity of one another, waiting for the blessed, brief cool of evening to descend. Anticipation hangs in the air, a dead, hot weight. My skin feels sinfully scorched and my eyes gritdry, I squirt Natural Tears from Boots the chemist into each one and they run down my face and leave two tracks on dust dredged cheeks. When the sun begins to slide it does so in earnest, as if in a hurry to escape. We hasten back to camp before dark envelopes us. Lengthening shadows tiger-stripe the road and just before it tips over the western edge, the sun is snagged, ever so briefly, in the branches of a baobab. I catch the moment on camera. I hear the lion again that night. And a hyena’s whoopwhoop. But the tent is zipped, the car is close by and the campfire will smoulder until dawn. Are lions scared of fire I ask Ant. But he is already fast asleep. When I get home the next evening, I empty the contents of my bag into the washing machine, I strip bedrolls and fill the laundry basket for a second load, I empty the cool box of a six pack of warm beer which I restore to the fridge, I download the photographs from my camera. And into Google I type a question, ‘from how far away can you hear a lion?’. Not near. But near enough. Sometimes I feel like a lozenge. As if marriage and motherhood swallowed me up and sucked me to something so slight I am almost invisible. We had a rare and impromptu dinner party last night. I worked feverishly all day trying to eke from the vegetable garden and the freezer the makings of supper time fare fit for eight. Colourful Swiss chard with stems of saffron and cochineal, hard little peas soaked in peppermint tea to encourage them to plump tenderness, rhubarb, all pink and fleshy and real custard made from quails’ eggs for that was all I had; I patiently broke 30 tiny eggs, their marbled shells softly yielding, into a basin to beat and stirred my custard in the double boiler my mother used to make porridge in when I was a child. And I set the table and built a fire and put a slick of lippie on and waited for my guests knowing that the Achievement of The Day had come in a meal hobbled from what I could find. My guests ate well and much wine was downed but it was hard not to notice that almost all the conversation was borne of their work day, elements of which they had all shared on some level. I, who’d pottered in a quiet studio and stooped over tidy, greenfeathered rows in a sun drenched vegetable garden, was mostly mute. How many children do you have? Asked one guest, a lawyer. I am sure I’ve told her before. Three I say and motion toward a photograph. But her interest is already waning. When will they next be home? Asks another. December I say. I’d like to say more but I know what I will sound like: I will sound like the woman whose children’s presence is her lifeblood. Her oxygen. They are my life. But I am aware, and delighted, that they have their own. What’s the puppy called, inquires a third. Gippy I say. But he doesn’t ask why. And I don’t have the confidence to elaborate. (Which is a shame: for thereby hangs a tale). Nobody asked me what I did. What I do. I would have loved to have told somebody about the photo journalism collaboration I am working on, the writing competition I entered, the travel commission I’m working on. I have stories. But they got stuck in my throat, like lumps. Instead of loosening them, my stories, I ferried dirty plates from the table and delivered my Rhubarb Grunt (nobody asked what it was and there was a story attendant to that too; another lost opportunity to exhibit Myself), the topping was perfectlypalegold, the fruit bubbling in its vinrose juices. Look s a bit overdone, remarked husband. Nobody commented on my custard. Which was finished by the time the jug got round to me. I bear no rancour toward my interesting (even if disinterested) guests; I only feel cross at myself. I lay awake most of the night and pondered, is this because I’m a married to a man whom I have followed dutifully, gone where he has wanted to go, trodden his path, been a little hidden in his shadow? Is it because I was a stay at home mother? Is it because I’m of a certain age; according to a survey, women become invisible by their late forties. I’d have loved to have been invisible at Four. Or Eight. But not at 48. Is that why I’ve been sloughed to something that feels insignificant? I lie and I plot. What if I embarked on an adventure all of my own? Would I have the courage to became Pauline Collins’ Shirley Valentine (without the oily mustachioed Greek waiter)? Or Julie Walters’ Susan in Educating Rita? I shall call myself Calypso, she who conceals, I tell myself. And I shall travel to India and I shall return wearing a sari and sporting a bindi, with psychedelic souvenirs and dysentery. And Stories. Big loud clamouring colourful stories all of my own. Sometimes, when I feel very far away, I think about my paternal grandmother. And sometimes that helps. Sometimes. When I am feeling big hearted and brave. My dad’s mother arrived on a ship in Kenya in 1920. My grandfather had arrived sixteen years earlier as a very young man, a boy. The story goes (as all the best fairytales do) that when his mother died, and because he hated his (indubitably wicked) stepmother, he ran away from home and stowed on a ship bound for Africa. He overshot his final destination though and had to trek up from the Cape. I don’t know how true any of that is; time and enthusiasm often render stories bigger and better. In any event my grandmother, whom my grandfather had returned to Scotland to meet and marry, arrived in Mombasa with a humble trousseau and two barrels of preserved mackerel. The barrels were dropped during the vessel’s offloading and split on the quayside and the fish slithered saltily back into the sea. And then Granny travelled to her new home by train, its engines fed by coal so that you had to keep your windows shut (even whilst crossing the arid, panting Taru desert as you rumbled north where you longed for a whisper of a breeze) for the sparks that might fly in and set you and your bedding alight. The final leg of her journey was made on the back of a mule and Gran arrived to a home which had earthen floors and no running water or electricity (charcoal enveloped in chicken mesh and kept damp served as something approximating a cool pantry). I was born into this continent, grew up here; the heat and the dust and the flies and the language and the challenges with water and electricity are second nature to me. To her they must have been shockingly alien; she had barely left her small village in Scotland; she’d never ventured as far as Edinburgh. But in her stoicism she didn’t just endure it all, she embraced it. She bore five children in sixteen years and raised them on sprawling ranches, she grew pigs, she adopted a cheetah cub when its mother was killed by hunters, she knitted her family necessary socks and sweaters, she made the best marmalade in the country and she never succumbed to an electric whisk, not trusting anything but the strength of her right arm to get meringues just so. She wrote letters to her backhomeinScotland siblings who must have received her news with wry disbelief, cheetahs beneath a dining table? A monkey that takes rides upon pigs’ backs? Really?! and she waited patiently for months for a reply to arrive on the farm. As I write this, I am chatting to my son on Skype and my phone is pinging with whatsapp messages from my elder daughter on a train on her way to work. So when I feel far away, and when I am feeling gracious and generous and a little bit stoic myself, I think about my Gran. Because of where I live, because of all the circumstances that surround this peculiar disjointed life of mine, because I am compelled to feel ‘useful’ despite not having a job, there being no children at home, because of all of that, I feel bound to propel myself through my day. I go from chore to chore, as stepping stones. I have several rules which I apply simply because I feel if I began to indulge, I may reach a point of no return and my day would disintegrate which would leave me disintegrating too. I never watch the television during the day. Not unless I am unwell. And I never siesta. Not unless I am unwell. So today – as I do every day – I walk the dogs for almost an hour before breakfast. It was cold this morning, I walked in wellies with a scarf wound about my neck. The wind bit as I turned to face home. This afternoon, when I walk, the sun will beat down and I shall peel off my sweater and the dogs will pant and lag. In the morning they bounce and race one another and tear ahead of me. I entertained a rare guest for breakfast. He is here on business. And needed a quiet morning to collect himself and his agenda before heading to the office. He is from Holland. I wondered as we sat across the table from one another over toast and coffee what he makes of my dislocated far away living? Ordinarily my breakfast is a mug of muesli at my desk. My morning was spent in front of my computer. Paperwork. Except it so rarely is now is it? The ticket I booked for Hattie will never materialize as anything tangible; a reference number on a screen, that’s all. I write a paragraph for Ant, something he needs at work. A brief dip into the cerebral. Learning something I didn’t know before. I drink last night’s tomato soup for lunch and then spend the afternoon bowed over lampshades so that now my shoulders ache. I made three as I listened to Women’s Hour and thought what wonderful company Deborah Mitford must have been; she spoke to Jenny Murray with such candour and eloquence about her life, she giggled about Coming Out (‘but not that kind of coming out’) and described her chickens and the delicious brown eggs they lay and her abiding passion for Elvis. Then, with ipad in hand and the Duchess of Devonshire describing how harrowing it was to live with an alcoholic (her husband), I head to make a start on a Shepherd’s Pie for supper. The scent of lamb mince and garlic attracts Gippy. She sits obediently just outside the kitchen and I can’t resist feeding her some of the honey sandwich I make myself. And then it’s 4pm and the day, which has taken pleasing shape as fullfat, (they’re not all like this, the days, some are hollow with jutting ribs which dig and worry me) is getting to its end. Soon I will feel able to step back. I will walk the dogs in a while with some tiny sense of satisfaction (my morning walk is full of anxious plotting about how I’ll fill the hours that stretch ahead; I never enjoy it as much as my late afternoon outing – which is always better because either the day has delivered or, if it hasn’t, it is, thank god, almost over). Deborah Mitford scoffed at happiness; she suggested contentment was what we ought to aspire to. I think she may be right? Perhaps happiness is too transient, insubstantial? Is contentment weightier I wonder? Will it endure better in the face of what life lobs at us, sustain for longer? In my other life I might be living in London. It’s a kind of sliding door scenario. I was engaged once. Before. So young. The proposal came not long after my dad died. So I was bruised. Lost. At sea. Looking for anchors. I’d only been in London for four months when the call came. Your dad’s had an accident. Is he OK (it never occurred to me he wouldn’t be). No. He’s dead. 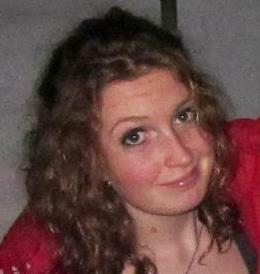 I was just 19. D asked me to marry him barely six months later. And I said yes. He was a broker at Lloyds. Suits by Gieves and Hawkes (whoever they were). A flat in Clapham. He’d only ever lived in big cities: London, New York, Chicago. I’d only just moved to my first. When I wonder backwards I cannot fathom what we might have had in common? Perhaps each thought the other exotic? Perhaps each needed a person just then and we happened to be where the other looked? Perhaps he felt sorry for me? He bought me a dainty solitaire in Mappin and Webb. I ordered a taffeta dress at Tatters on the King’s Road, a veritable meringue in ivory silk. Nothing about anything I was doing was normal-for-me. It ended. Inevitably. Two very different creatures had bumped up against one another briefly and then realized, in time happily, that they were never going to fit the other’s world. Ant wandered back into my life by accident – we’d been friends years before; he needed a place to stay whilst passing through London. He might have made the call to somebody else. I may not have got to the phone in time. We were married 18 months later. I wear an engagement ring which we carefully designed together, set with a deep green Tsavorite, mined from the harsh, arid scrubcountry not far from where I grew up. Mum made my wedding dress, beautiful almostrose silk dupion from Liberty. Home-grown; home-made. Auspicious beginnings; that’s much more like me.